Where they cut down all the trees and name the streets after them. — Malvina Reynoldsnote Incidentally, the song ("Little Boxes") was directly inspired by the Westlake District of Daly City, a suburb of San Francisco. The place where the Dom Com usually lives. People live in houses that, while not exactly palatial, are still a lot bigger than they ought to be. Most of the houses look alike, having been built according to the same two or three plans. Instead of a Main Street like most small towns, a suburb will have The Mall, be it a big, enclosed shopping center or a strip mall with a Walmart. You can walk or ride a bike to a few places, but not most of them, so plots involving the availability of a car (such as the Very Special Episode about drunk driving) are possible. A deep well of satire and (often not very affectionate) parody, especially from disaffected youth. In the middle of the last century, the American intelligentsia were obsessed with attacking the actual and perceived shortcomings of suburbia; by the nineties, the idea of satirizing suburbia was itself satirized. The fact that we have an entire trope about this, Stepford Suburbia, speaks volumes about the way many Americans view the suburban lifestyle. The Coastal Regions, which is essentially The City, except that people have yards. Most people are college educated, middle-class, and at least slightly liberal. If not California, then the Northeast is readily available. The Midwest, which is more rural. Family Values often abound. Frequent forays into the Quirky Town and the Town with a Dark Secret. Poorer and less educated than their coastal brethren, and somewhat more likely to be conservative. Often, these portrayals stray far from real life and enjoy an undercurrent of hypocrisy (the respectable church-goers are all sleeping with each other), partly to add color, but mostly because the Midwest is just slightly less alien than Mars to most of the folks who write TV. The gated community. Entrance to this neighborhood is restricted to residents, mail and delivery men, cops, and visitors, with a guard booth at the road in and out. Often shares the conservatism of Midwestern suburbs, with the residents of the community hoping to create a idyllic life for themselves, just like in those Fifties sitcoms, free from "those people" outside. There's also a big element of snobbery and class warfare — these people bought their way into Sunnyside Estates, thank you very much. Now for the boring history lesson. While American cities have always had suburbs, it was not until The Roaring '20s when the rise of inexpensive streetcar, automobile, and rail transit services made living out of town and commuting feasible. The modern concept of suburbia didn't take off until after World War II however, when the G.I. Billnote Short version — a law passed near the end of the war that gave veterans access to higher education, as well as loans to buy homes and to start businesses., cheap gas, cheap land, the new Interstate Highway System, and the postwar baby boom created an enormous demand for housing that couldn't be met by the cities alone. As a result, cities began to expand outward rather than upward. Similar factors were in play in a few other countries, most importantly Canada and Australia, both of which also now have very large suburban populations. The quintessential American suburb as we understand it (lots of houses, big lawns, happy laughing white children, etc.) was more or less invented in Chicago around 1950. The first purpose-built suburb with this design was envisioned as a giant park, a huge relaxing playground that people happened to live in. Thus the open, rolling properties with no fences or walls between them. American suburbia was subject to de facto (and sometimes de jure) segregation in both the North and the South, with real estate agencies often barring their realtors from letting black families see homes in the nicest neighborhoods (a process known as redlining), black veterans often having trouble getting their G.I. Bill benefits, and contracts frequently prohibiting white homeowners from selling their property to black families. While these shady tactics were outlawed in The '60s, by this point the predominant whiteness of suburbia was well-entrenched. By the late '60s, The '70s and beyond, this made it attractive for people upset with the more far-reaching forms of desegregation (especially busing), leading to a phenomenon known as "white flight" in which middle-class white families moved out to the suburbs, taking their tax dollars with them and leaving the cities behind to decay. Eventually, even those who had elected to "stay and fight" for desegregation (including, ironically, much of the nascent black middle and upper classes) saw themselves forced to flee to the suburbs out of economic necessity due to the resulting collapse of the inner cities. This booming suburban voting bloc was a key component in the "Reagan coalition" that rose to power in The '80s. Since The '90s the suburban trend has mostly retreated, with a plethora of young people, typically college-aged or in their twenties, migrating back into the inner cities, leading to increased gentrification in those areas. 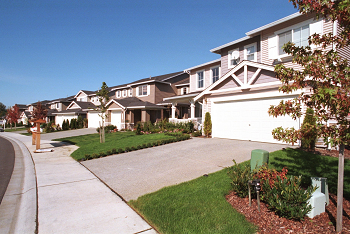 A few likely causes of this movement include frustration with the suburban lifestyle, economic opportunity, the lower cost of renting an apartment in the city versus owning a house in the suburbs, the perception that automobile-dependent suburbia is environmentally wasteful, and a desire to "transform" what are viewed as needy communities. One generation later, the first of this wave's kids are starting to send their kids to Inner City Schools. Interestingly, in many metropolitan areas, stagnation of the suburbs tends to be restricted to the inner suburbs, with many of the newer outer suburbs still growing. The reasons are simple- the rich and people with children are chasing space and low taxes, the working class and educated childless are either staying put or moving to cities which have more social services and a nightlife. Traditional suburbia experienced a last gasp of growth in The Aughts with the rise of the so-called McMansions, but the 2008 housing crisis killed the very notion of it. Soon, scores of formerly bustling suburban areas became literal Ghost Towns. However, some have survived by means of gentrification, becoming "pocket cities" of sorts. Note that, in much of Europe, the suburbs have very different connotations, and are often depicted as ghettoes and housing projects where the chronically poor and recent immigrants find themselves in — not unlike how the inner city is depicted in American media. Compare, say, the British trope of the Council Estate, which is, superficially and functionally, similar to suburbia (they're both cheap housing built after the war on the outskirts of the city), but is associated with poverty and crime rather than safety and prosperity. American-style suburbia, with single-family homes occupied by middle-class families, does exist in Europenote Again, a British example — the Dursleys in Harry Potter live in such an area., but it's uncommon due to much tougher land use and zoning laws necessitated by Europe's relative lack of space.note The population density of the US is 32 per square km, while the EU has 112 per square km; put another way, Europe fits 1.5 times as many people as America in under half the amount of land. Now you know why Europe has stricter land-use laws and less sprawl: there's less land to go around. This is because Europe has supported large cities for far longer than the US—the Native Americans of what is now the US had some occasional proto-cities, but Europeans showed up around the time the most recent native North American urbanization had petered out—arguably causing it to peter out, by introducing plagues—and in any case urban civilization in the future USA never got close to where it did in Mexico and the Andes. These connotations are more in line with how suburbs have traditionally been viewed — "suburbs" translates from Latin as "under-city", or the red-light district. That's the meaning William Shakespeare would have had in mind when, in Measure for Measure, he has Mistress Overdone keeping a bawdy house in the suburbs. Even North American suburbs are prone to the same thing: for example, some suburbs of Toronto, Canada are notorious for gangs and recent shootings, namely around Scarborough and Jane & Finch (named for the two streets forming the intersection)note technically no longer suburbs since the 1998 amalgamation but still considered to be by many locals, and the Chicago suburb of Harvey, Illinois (which itself is similarly unsafe) was home to the Dixie Square Mallnote opened in 1966, closed in 1978, finally demolished in 2012 after several false starts, as featured in The Blues Brothers. For examples in fiction where all of the houses look basically alike, see Cut-and-Paste Suburb.